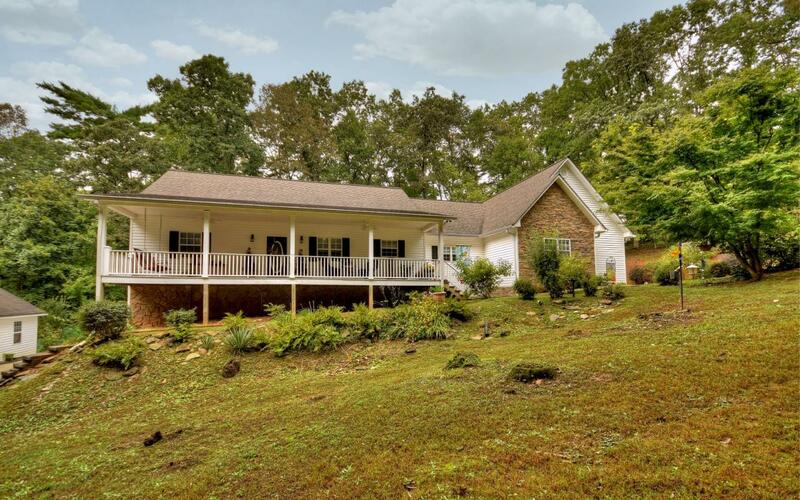 Traditional family home nicely tucked in the back of 1.54 acres, yet just a couple miles from Ellijay! One level living at its best all rooms are Oversized!!! Big laundry room includes a pantry. Kitchen features top of the line SS appliances, including a French drawer refrigerator, and commercial grade gas stove w/ vent hood. Solid surface counters/ light cabinets, open dining concept w/ island & dining area. Living room w/ fireplace, T&G wood ceilings. Master suite, opens up to sunroom, Mstr bath w/ make-up vanity, corner jetted tub w/ TV connect, & tile walk in shower, big closet. Finished basement w/ in-law suite, & kitchenette, bonus room , game room/den plus additional storage room could serve as 4th bedroom. On generator. 4 car garage!! 2 attached 2 detached, Firepit on stone landscape patio, covered front and back porches. What a deal!